Google reveals its Chromecast 2 media streamer, adds Chromecast Audio | What Hi-Fi? Google reveals the successor to its Chromecast media streamer, the Chromecast 2, and introduces Chromecast Audio. It had been rumoured that a successor to the original Chromecast dongle, launching in the UK several months after the US, would be announced at a Google event held on 29th September. And the tech giant didn't disappoint, revealing what the imaginatively titled Chromecast 2 has to offer. Like the original, the Chromecast 2 will continue to 'cast' music, video and games to your TV, with support for iOS and Android devices (sorry Windows, only desktop support for you). It will cost the same (£30) and comes with a number of improvements, claims Google. Chief among these is better wi-fi performance thanks to a new built-in adapative antenna system, an improved interface and a slimmer design, along with 'Fast Play' (arriving in 2016), which Google says will help apps and content load faster than they did on Chromecast 1.0. There's also support for Spotify. But there will be no 4K video capability on this version, with resolution capped at 1080p. Connection to your TV, as before, will be via the built-in HDMI plug. You can expect old favourites such as Netflix, YouTube, BBC iPlayer, BT Sport and NOW TV on the latest device, with new Cast-enabled apps including Spotify and Google Photos joining them and BBC iPlayer Radio arriving soon. 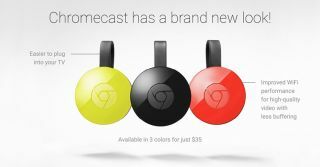 The Chromecast 2 comes in three colours: Black, Lemonade and Coral, the last two exclusive to the Google Store. And it's available from today. Alongside the new Chromecast 2 media streamer, Google has also announced its Chromecast Audio dongle. Like the Chromecast 2, the Audio offers simple plug-and-play operation: once the device is hooked up to your hi-fi, just download the app to your phone to set up Chromecast Audio via wi-fi. You can cast music from any device on the same home network by tapping the Cast button on any app that enables it. Through the app you can "search, play, pause, queue songs and turn up the volume from anywhere in the house." Similar to Chromecast 2, it will work with iOS and Android devices, Windows laptops and Chromebooks. 3.5mm/Aux, RCA and optical inputs will be supported and apps such as Spotify, Google Play Music, Deezer, BBC iPlayer Radio and others will be available to use. A neat feature of the Chromecast Audio dongle is its multi-room synchronisation, so you can stream your music from room to room. You can also share music with your family and friends, and the dongle's multi-tasking ability ensures you can take a phone call without interrupting music playback. You can also cast any audio from your Android phone or laptop to your speakers. Chromecast Audio is available now and will cost you £30.